Specimen-1: Draft a circular letter announcing change in Firm’s Status. Or, draft a circular letter announcing conversion of partnership to a private limited company. 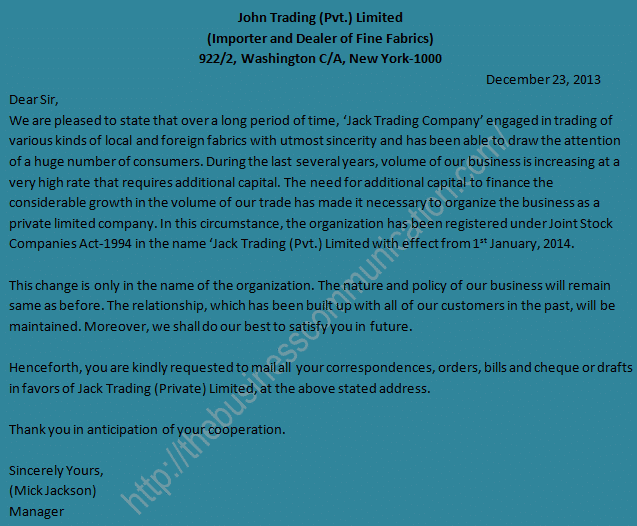 We are pleased to state that over a long period of time, ‘Jack Trading Company’ engaged in trading of various kinds of local and foreign fabrics with utmost sincerity and has been able to draw the attention of a huge number of consumers. During the last several years, volume of our business is increasing at a very high rate that requires additional capital. The need for additional capital to finance the considerable growth in the volume of our trade has made it necessary to organize the business as a private limited company. In this circumstance, the organization has been registered under Joint Stock Companies Act-1994 in the name ‘Jack Trading (Pvt.) Limited with effect from 1st January, 2014. This change is only in the name of the organization. The nature and policy of our business will remain same as before. The relationship, which has been built up with all of our customers in the past, will be maintained. Moreover, we shall do our best to satisfy you in future. Henceforth, you are kindly requested to mail all your correspondences, orders, bills and cheque or drafts in favors of Jack Trading (Private) Limited, at the above stated address.